Ted Yoho Comments on African-American Voters-Fiction! - Truth or Fiction? Ted Yoho Comments on African-American Voters-Fiction! 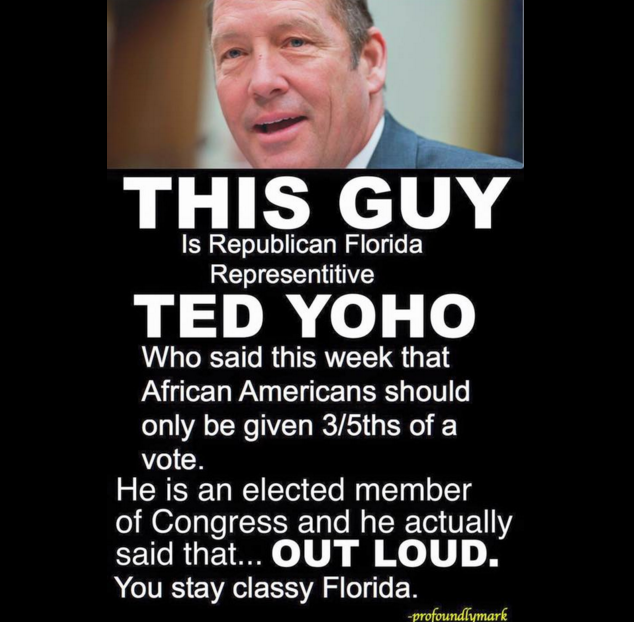 Congressman Ted Yoho, a Republican from Florida, said that African-Americans should only be given a 3/5 vote. A fake news website is behind the bogus Ted Yoho quote about African-American voters. Like most fake news stories that go viral, however, this one holds a sliver of truth. Ted Yoho drew unwanted headlines in May 2012 after a video surfaced of him campaigning for the congressional seat that he went on to win. The comment was controversial in its own right, but Ted Yoho never said in the campaign stump speech that African-American voters should be given a 3/5 vote. The fake news story didn’t gain a lot of traction at the time it was published. However, the 3/5 voter claim was made into a meme that was widely shared on social media. Taken out of context, many believed that the comment was true — but it’s not. Cold Stone Creamery Offers Discounts to Pregnant Women-Truth! & Fiction! California Gun Law Takes Effect January 2016, Guns to be Confiscated Without Notice- Truth! & Fiction!